Just a few years ago, Asus was just another brand in the smartphone market. However, things changed at pretty fast pace and now Asus is one of the key players of the Android Smartphone market. It was the ZenFone Series which created a lot of buzzes and it turned out to be the most successful smartphone series of the year. Asus continued to cash on the success of ZenFone by launching the ZenFone 2 series which is still selling like hot cakes in the market. Asus also launched a device with auto-focus and named it Asus ZenFone 2 Laser. The phone had some great specifications at much affordable price range. It seems that Asus has decided to rule the smartphone market which is the reason that the company has yet again launched a new device or say an updated version of Asus ZenFone 2 Laser. While the older version is powered by a Snapdragon 410 Quad Core 64 Bit processor, the new version packs a better and powerful 64 bit Octa Core Snapdragon 615 Octa Core Processor. The new processor will improve the multitasking ability and will also enhance the speed of the phone while performing some heavy tasks. Asus ZenFone 2 was the first phone in the market to come up with a 4 GB of RAM. Asus ZenFone 2 Laser 5.5 features 3 GB of RAM which is a major upgrade from a 2 GB RAM. Now-a-days, we have so heavy games with high-end graphics that they demand at-least 2 GB of RAM. So, now you will have ample of RAM left even when you are playing Asphalt 8. The phone offers 16 GB of internal storage which can easily be expanded up to 128 GB using a microSD card. If that is not enough for you, you will also get 5 GB of Asus’ web storage as well as 100 GB of Google drive space. So, no more need to worry about storage issues. Asus is known for offering some best in class camera smartphones and ZenFone 2 Laser 5.5 is not an exception. 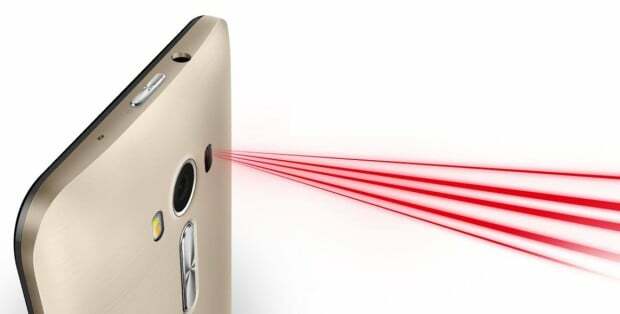 The most highlighting feature of the device is its Laser Auto-Focus which is found only in flagship phones. The phone sports a 13 MP PixelMaster rear camera with Dual-LED flash and a 5 MP front camera for clicking beautiful selfies. The phone has got a plethora of features and also features a great hardware and software support. It runs on Android Lollipop out of the box with Asus’s very own ZenUI on the top. It is a Dual SIM phone which offers 4G support. The 3000 mAh battery also offers a decent backup and easily lasts for a day with one single charge. At 13,999 Asus ZenFone 2 Laser 5.5 is competing against Moto G 3rd Gen, Xiaomi Mi4i & Samsung Galaxy J7. Overall, the device offers many things at an affordable price which will again result in enormous success for Asus.